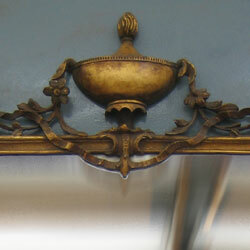 The button will return you to the top of the page. 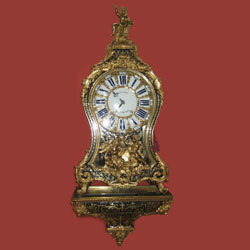 Click the to view clock departments work. 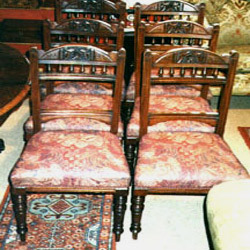 Please contact us if you have a specific enquiry, I will happy to answer any queries. 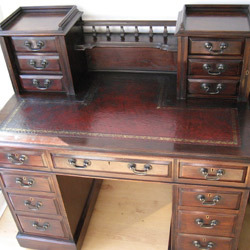 ""I am really pleased with the desk you did. 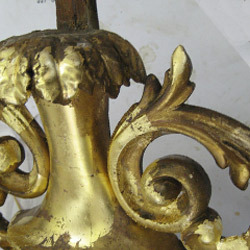 It looks great"
The replacement sections were water gilded in the traditional manner before toning in to match the existing gilding scheme. 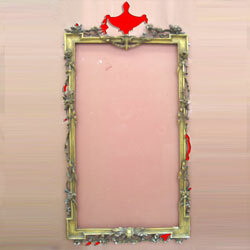 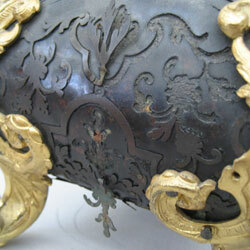 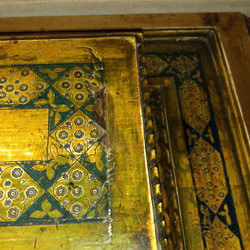 The Damaged gilding usually represents a larger area of loose or cleaved gesso. 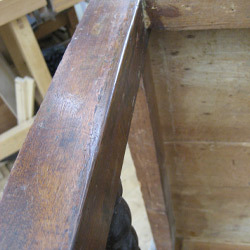 New gesso is built up as on the right, around 15 coats for this project. 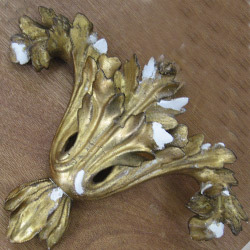 The replacement gilding here was 23.25ct gold leaf carefully matched to the original gilding, applied in the traditional manner. 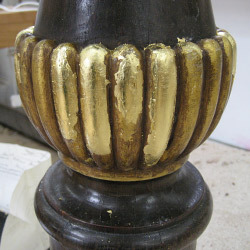 Finally the new gilding is toned in to match the original surface using a protective size coat. 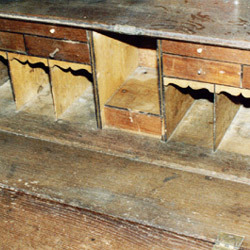 The fragile and detached areas were consolidated and carefully reattached using Isinglass injected under the lifted areas. 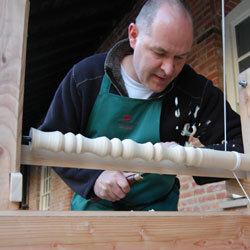 Final frame repairs are done before the new carefully colour matched bole is applied. 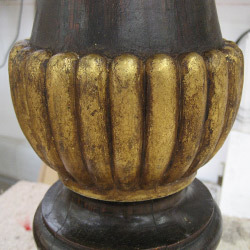 Finally the new gilding is toned in to match the original surface and highlights burnished on the water gilded areas. 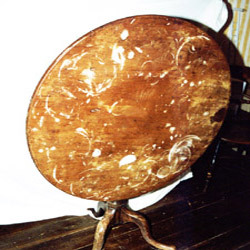 A protective coat of micro-crystalline wax completes the treatment. 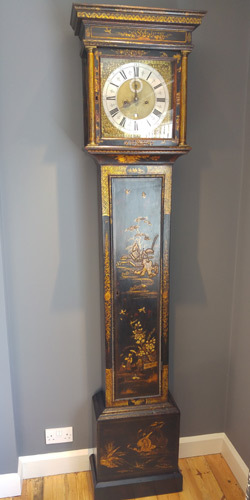 This unusual clock had been stored innapropriately for many years. 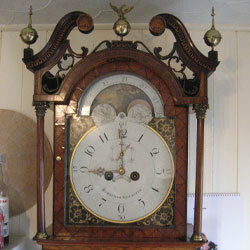 A full restoration to the case and movement were necessary to return the clock to working order. 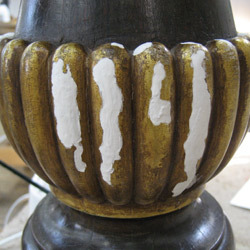 The replacement carving was matched with the original, and many missing sections of banding had to be hand cut from the solid. 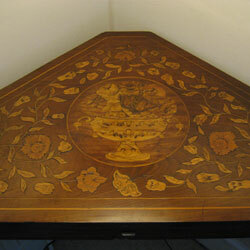 This early 19th century Dutch Marquetry folding card table was missing its central motif, the remaining marquetry needed localised consolidation. 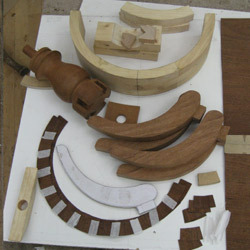 After planning the new roundel by research and digital prototyping the new panel was cut, glued onto paper and fitted. 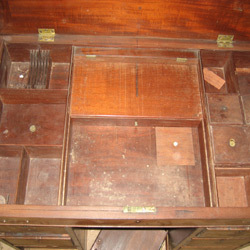 The new panel needed careful colouring and polishing followed by a good quality wax finish to help protect the top from future damage. 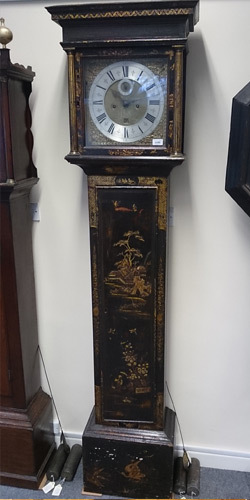 This late 18th century Lacquered Longcase clock was from the workshops of Claude du Chesne, an Important Hugenot clock maker with examples of his work in the Victoria and Albert museum. 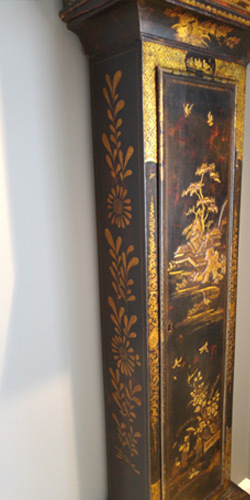 The case needed a full restoration as the Japanned finish was lost on the sides and badly damaged on the front. 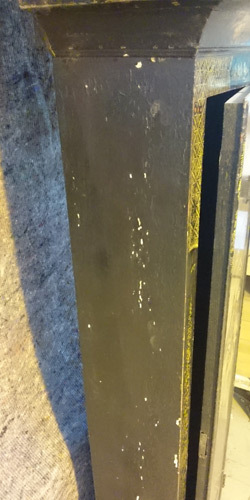 The base of the trunk was lost completely. 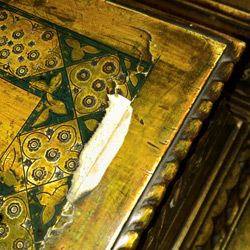 The new Japanning needed careful matching and toning of the gold leaf to match the original work, followed by a good quality wax finish to help protect the surface from future damage. 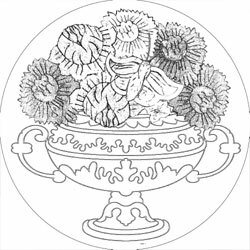 The Japanning of the sides were reproduced from existing examples and the design is based on stylised chrysanthemums, a popular chioiserie motif. 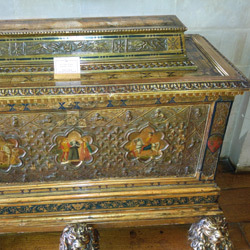 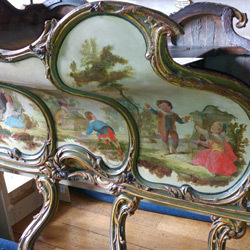 This important late 17th century marriage cassonne had suffered damage to it's cut gesso and polychrome decoration. 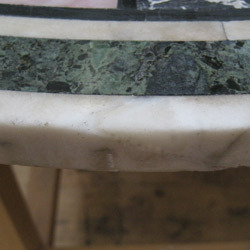 The new gesso was applied and allowed to cure before cutting in the design in the traditional manner. 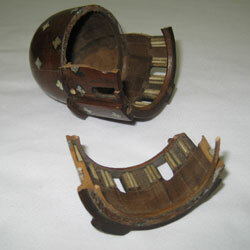 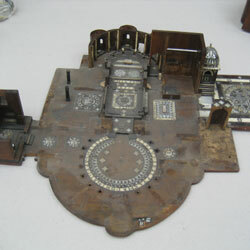 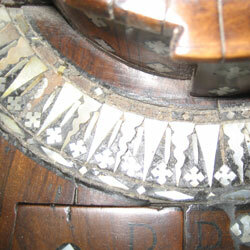 This heavily damaged Olive-wood pilgrims model required extensive structural repair and replacement of missing mother of pearl sections. 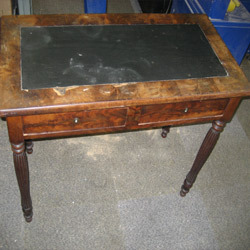 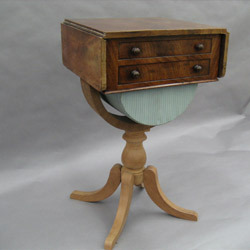 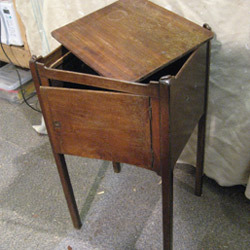 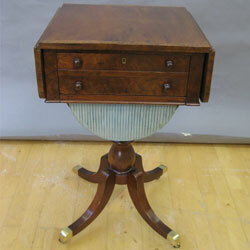 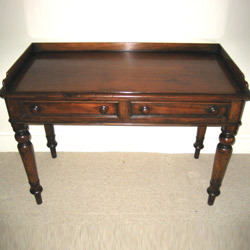 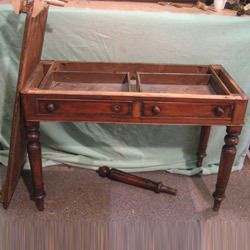 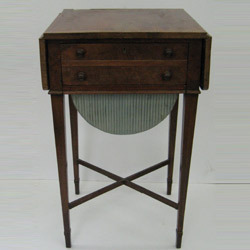 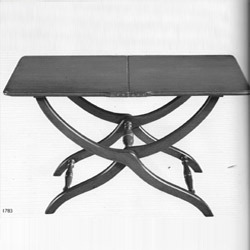 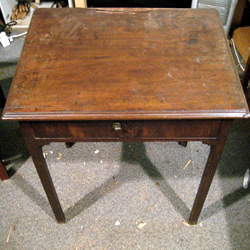 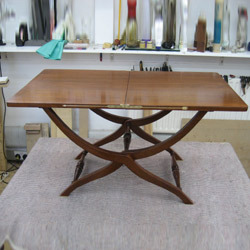 This regency work table had been altered around 100 years ago with the marriage of straight tapering legs. 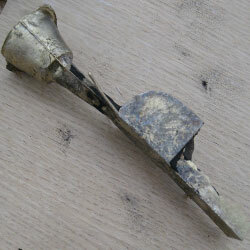 These were removed to allow consolidation of the remaining carcass. 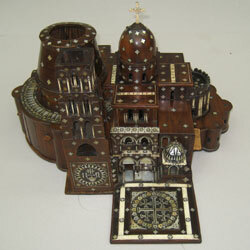 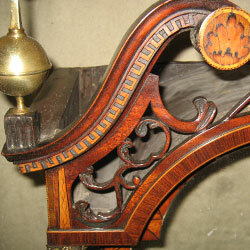 New components were constructed from period timber in the traditional nineteenth century manner. 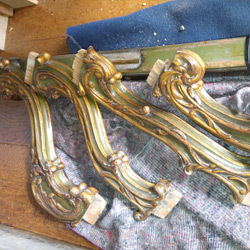 After repairing the top and replacing missing cross banding the new components were attached and coloured in to match the original. 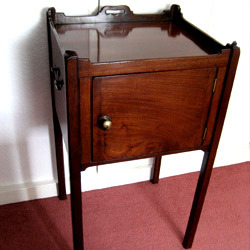 This pretty folding mahogany coaching table was reproduced from a photograph, as you can see some alterations were made to the original dimensions and design by adding a bespoke brass arrow detail and a handmade brass catch. 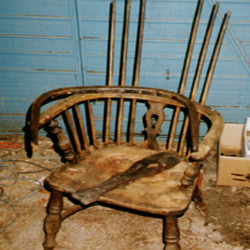 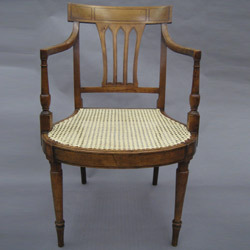 This chair was missing all 4 feet along with various splits and damaged caning. 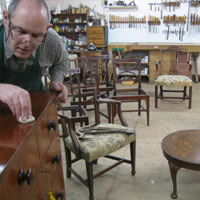 New feet were turned using Satin Birch, the splits were all consolidated and the chair re-caned. 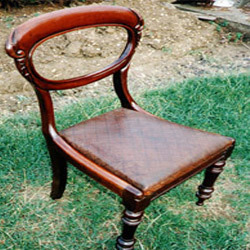 A difficult break in this walnut fauteuil was carefully built up using 7 different splices of old walnut to provide an almost invisible and very strong repair. 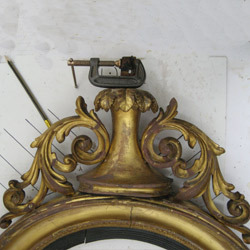 FTIR was used to establish repair history and allow controlled reversibility. 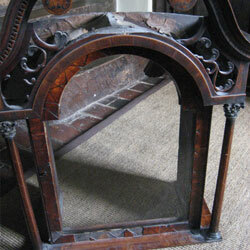 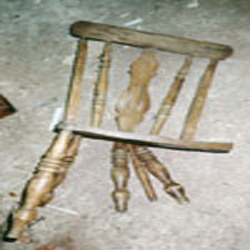 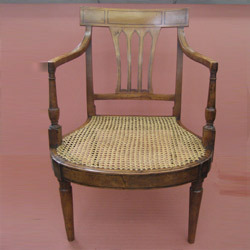 This rare late 17th century chair had suffered extensive common furniture beetle damage. 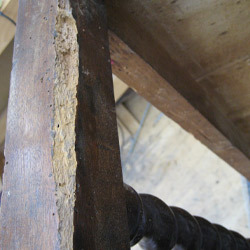 After treating the infestation the damaged timber was consolidated and the missing area reconstructed by epoxy casting over japanese tissue. 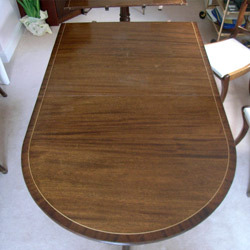 The Damaged lacquer on this dining table was repaired before new lacquer was applied to bring up the finish. 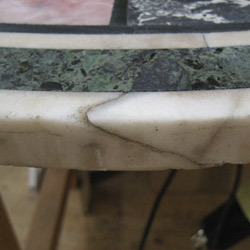 This Pietre Dure table had a structural crack that was also unsightly. 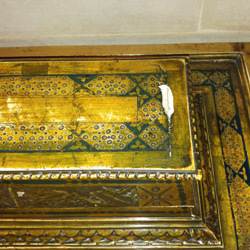 After treatment the marble was cleaned and treated with a protective wax. 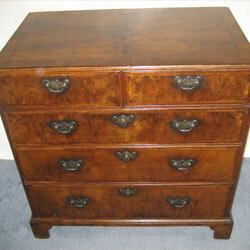 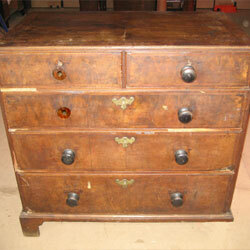 This early 18th century Walnut chest had suffered extensive woodworm damage and neglect, but was 90% complete. 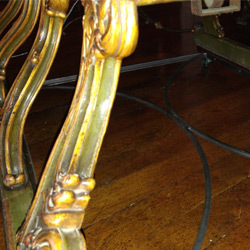 After careful reconstruction of the damage done by fitting knobs the piece was french polished and waxed. 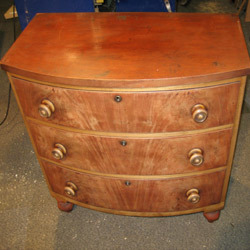 A Victorain Pot Cupboard having suffered extensive woodworm damage and neglect, but 99% complete. 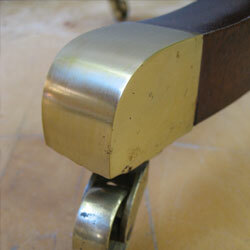 After Careful re-gluing and doweling of the ring, some minor veneer repairs the piece was french polished and waxed. 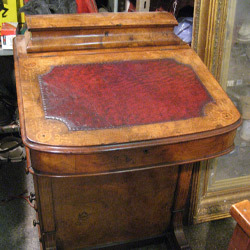 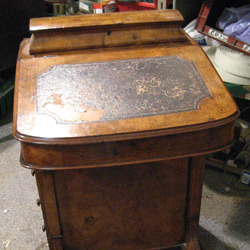 This late Victorian Writing table had suffered badly from watermarking. 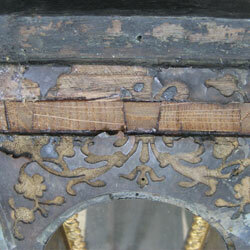 Approximately 50% of the mouldings were misiing and there was extensive structural damage. 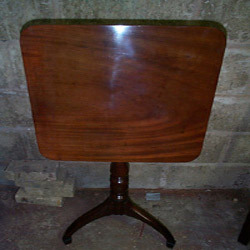 After French polishing the colour of the timber can be fully appreciated. 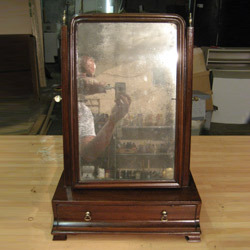 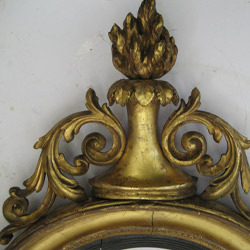 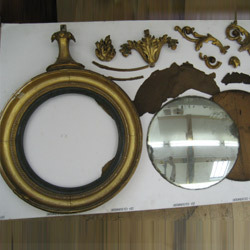 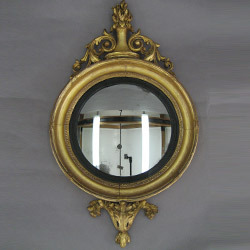 A super George II toilet mirror, missing its ogee feet. 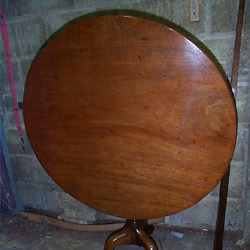 After fitting the replacement feet and some minor veneer repairs the piece was cleaned and waxed. 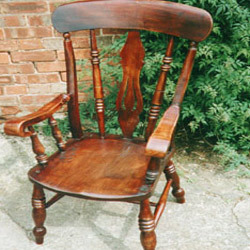 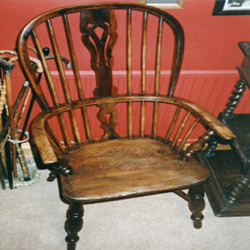 A super ash elm and yew windsor chair, apart from the structural damage all it needed was a clean and wax polish. 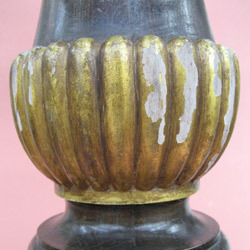 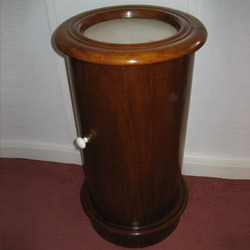 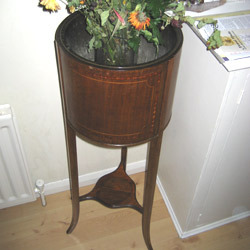 This jardiniere, was in a pretty bad way, after repairs and removal of the de-natured polish, the the colour shows through. 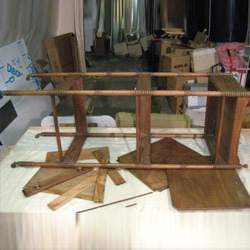 This chair was missing two stretchers and both arms when it arrived at the workshops. 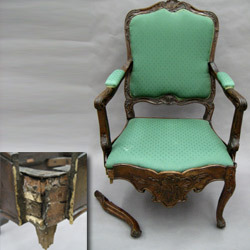 A full refinish was required to bring it back to life. 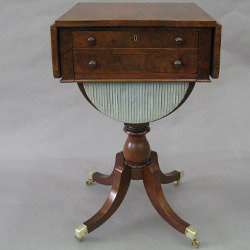 A rare George III side table missing a large section of veneer at the back of the table top, and requiring a bespoke brass swan neck handle. 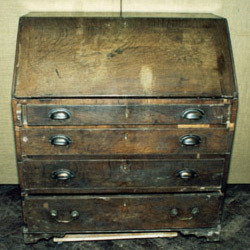 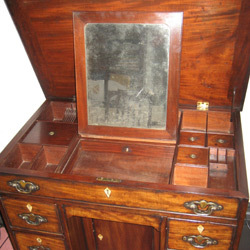 A George III oak bureau requiring total restoration including brasses, spliced repairs to the bracket feet and replacement of missing mahogany crossbanding. 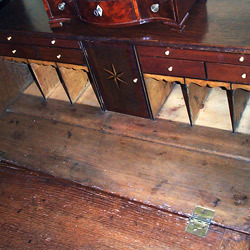 The new central door was made from period timber, the veneer for the star was handcut from holly and ebony and the knobs were turned from ivory on the lathe. 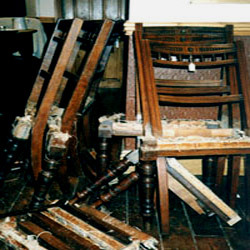 The frames had suffered woodworm damage - after removal of the infested timber, the frames were upholstered in a fabric of the clients choice. 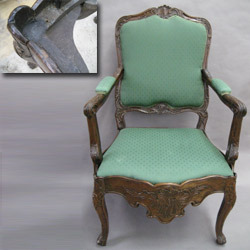 This balloon-back chair needed extensive frame repairs before using an old leather to complete the re-upholstery. 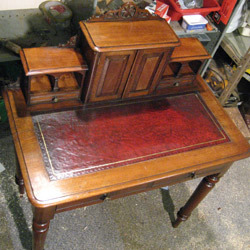 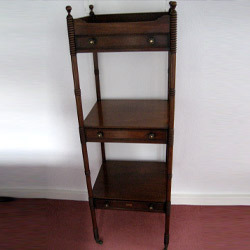 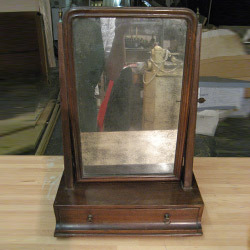 An attractive Victorian bonheur du jour needing a replacement hinge, a professional clean and a new leather. 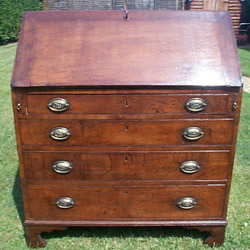 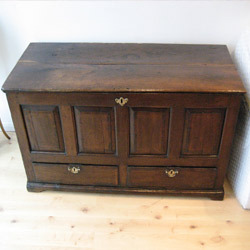 A rather dilapidated George II oak mule chest retaining its original brass. 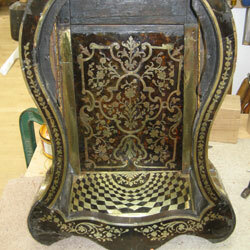 A wonderful colour had survived beautifully underneath the many layers of discoloured Victorian varnish. 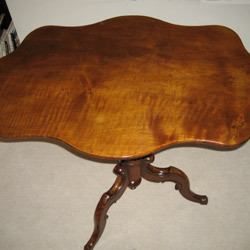 A georgian supper table in for a clean. 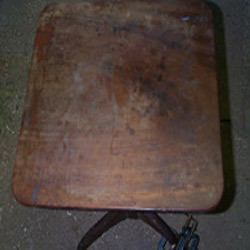 As you can see under the grime was a beautiful original patina. 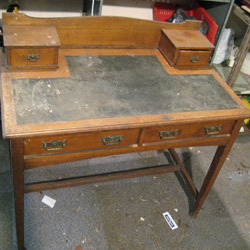 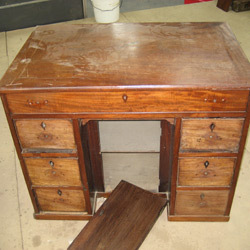 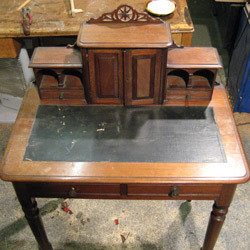 An arts and crafts influenced writing desk missing a section of moulding and in for a clean. 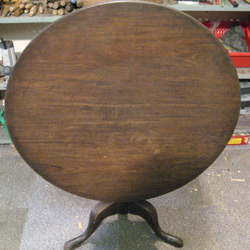 An early Victorian tea table needing a good a clean and some re-polishing to the top. 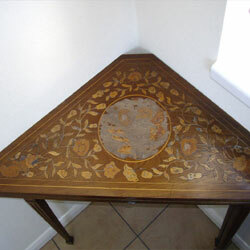 The Damaged leather on this desk was carefully removed before a new skiver was applied and gold tooled to match the original pattern. 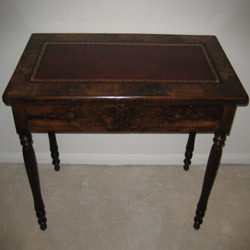 The Damaged leather on this davenport was a carefully matched skiver to the desk above, it was applied and tooled in black to match the original pattern. 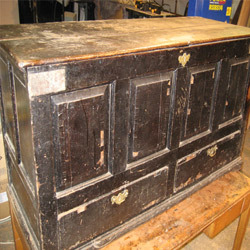 This George III pot cupboard needed the de-natured polish carefully removing before a full re-polish restored it to its former glory. 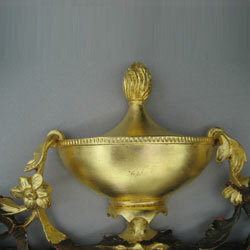 The reproduction brass fittings complete the job. 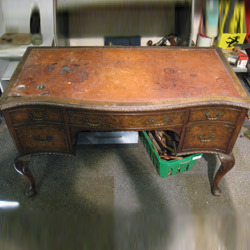 This William IV Wot Not needed some structural repairs and some black rings and scratches removing before a full re-polish restored it to its original condition. 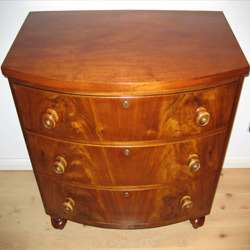 This Victorian country bow-front chest of drawers needed the de-natured polish carefully removing before a full re-polish restored it to its former glory. 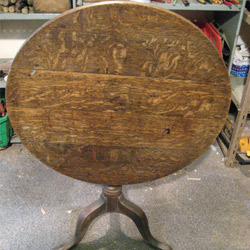 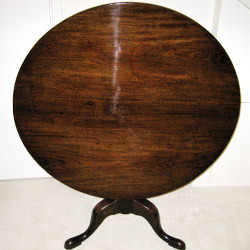 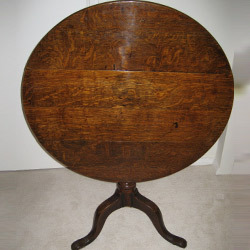 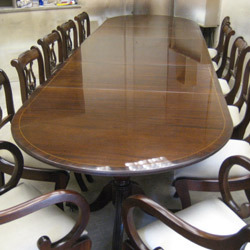 This Victorian breakfast table with a massive one-plank top was in wonderful condition underneath the damaged polish. 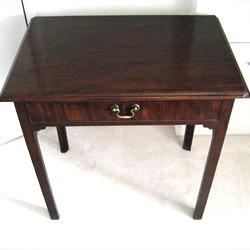 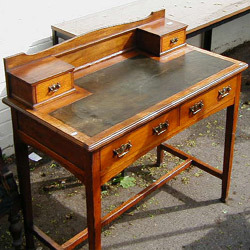 This late George III writing desk was missing veneer, and needed to have the 1930's leatherette removed and replaced with the original leather skiver. 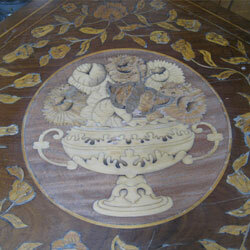 This late Victorian tea table had suffered badly from watermarking. 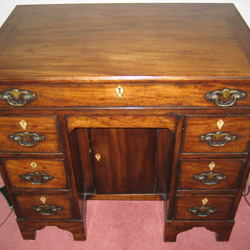 After a full re-polish the beauty of the timber really shows through. 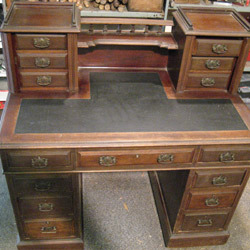 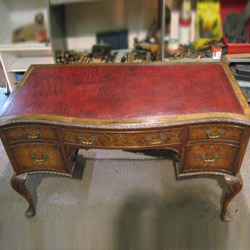 After replacing the drawer handles with reproductions of the orignal handles, and a new leather, the desk was french polished in the traditional manner. 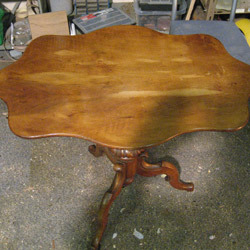 This pretty wine table had leg damage and as you can see the one plank top needed french polishing. 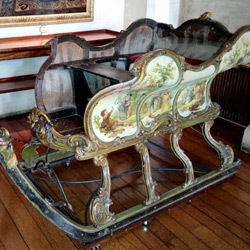 After restoration an iron and mahogany transport carriage was fabricated with rubber lockable wheels to allow the sleigh to be moved around without causing damage to the delicate parts of the object. 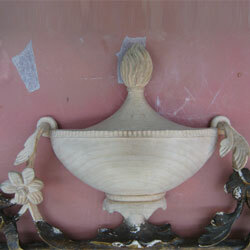 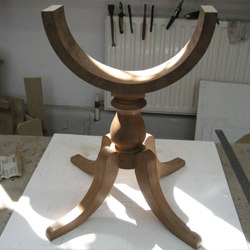 We can undertake many projects in-situ if required or if it is in best interests of the object. 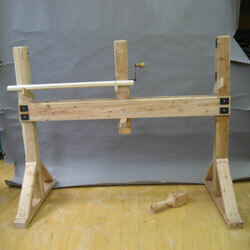 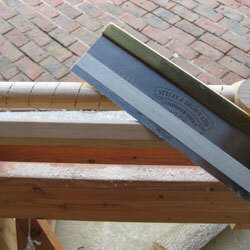 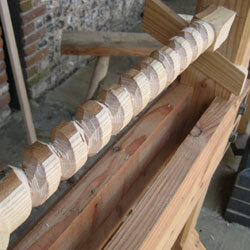 After research a pole lathe was built from seasoned larch, this example capable of centre and bowl turning. 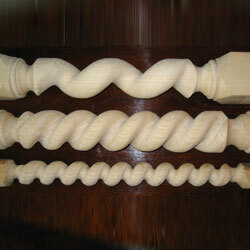 After some practice to master the basics I was ready to produce a twist. 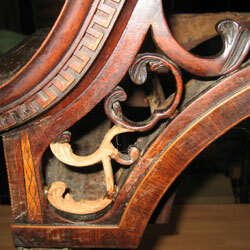 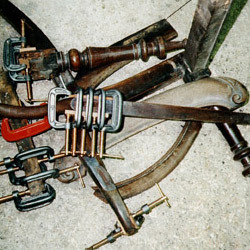 After marking out the pitch in the 18th century manner a saw cut provided the basis for roughing out the twist with gouges. 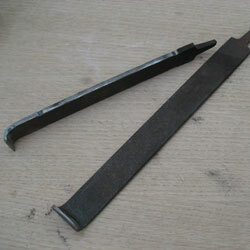 Then came the coarse medium and fine rasps, followed by coarse medium and fine files. 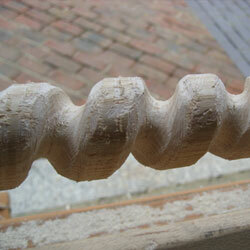 The final sanding was done using sharkskin and the twists burnished with shavings to complete the finish. 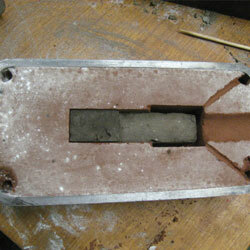 To reproduce a specific brass casting one option available is sand casting. 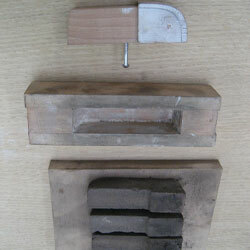 A wooden "plug" is made along with a mold to cast a "core" from sand - excluding the melt from the negative space. 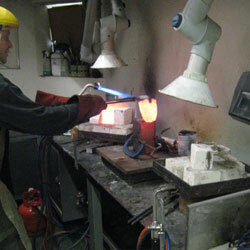 The brass is heated in a crucible along with borax to inhibit oxidation during the pour. 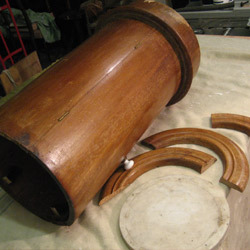 The casing can be seen on the right before removal of excess material. 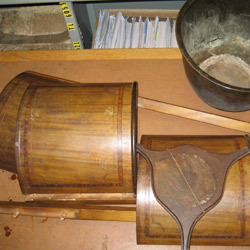 After removal and shaping, files were softened - shaped and re-tempered into scrapers to produce an authentic finish and witness toolmarks.